Many homeowners dream of having a beautiful garden. Somewhere to relax and spend time with family and friends. Trying to decide on the right course of action and devising a plan for its achievement can be quite time consuming, and it's often very difficult to know exactly where to start. 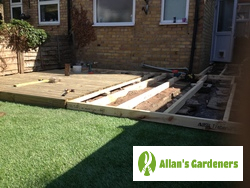 Allan's Gardeners can offer a service that will help you achieve the garden of your dreams at a price that is gentle on your bank balance. Garden design in Redhill RH1 is offered at a price that's affordable, and which delivers results you never thought possible. You'll be the envy of your neighbours, with a garden that's been well planned and executed to make the most of the available outdoor space. 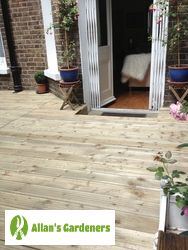 We've got an experienced design team who will come and discuss your ideas, and then bring them to life, from planning through to final landscaping and installation. We've been operating in your area for a number of years, but we also provide our services in a number of other locations, including: Bristol, High Wycombe, Reading, Slough, Oxford.